Keys beats Caroline Wozniacki; wins first clay court title and keys to a new car, too. What a week it’s been for Madison Keys. On Sunday afternoon, the 24-year-old American won the Volvo Car Open in Charleston, South Carolina, defeating Caroline Wozniacki, 7-6 (5), 6-3, for her first title on clay as well her first title since winning at Stanford in 2017. It was her fourth career title overall. Keys triumphed on her first match point opportunity by closing out the one hour and 46 minute WTA Premier-level final with a punched forehand volley winner, the final one of her 54 winners she hit on the Har-Tru green clay surface. She captured 76 percent of her first-serve points, including six aces, and won 67 percent of her service points overall. Keys broke Wozniacki’s service twice in six tries and was broken just once, coming in the first set. The American outpointed Wozniacki, 90-77, and it also marked the first time Keys had taken a set off the 2018 Australian Open champion. Not only did Keys receive first-prize money of $141,420 (U.S. dollars), as well as collect 470 WTA points to move up four spots in the rankings to No. 14. She also received a brand new Volvo car of her design. En route to lifting the trophy and receiving the keys to her new Volvo, Keys strung together victories over three former major champions (Jelena Ostapenko, Sloane Stephens and Wozniacki, who won the 2011 Charleston title). It was her first career wins over both Stephens and Wozniacki, and Charleston represented her first appearance in a final since reaching the 2017 U.S. Open final against Stephens. In the opening set, Keys faced a tie break that was hard fought. She had a set point at 6-4, but missed an easy backhand return that nearly cost her the set. It was one of 36 unforced errors that Keys committed during the final. Then, with courage and conviction, she went for it all on the next point and her backhand winner down the line paid off. Keys won the tie break 7-5. Keys played some of her best tennis against Wozniacki during the most important moments – none more important than during the tie break. Asked by Rubin what she was thinking during that moment and how she closed the set out, Keys scratched the left side of her head in search of an answer, then began to laugh. She said, “I don’t think I was thinking,” still chuckling about it in hindsight. “I’ll have to rewatch that point. It was during Keys’ post-match interview with Tennis Channel, sitting outside on the Stadium plaza with a towel comfortably draped around her shoulders – and with plenty of supporters looking on – that she looked and sounded relaxed and articulated what it meant to break her title drought. “I have to play with 100 percent believing in my game,” said Keys, who reached the final in Charleston in 2015 before losing to Angelique Kerber and was a semifinalist last year. “All week, I’ve had my own little battles each match, not ever beating Caroline here, and going after my first title on clay. I had a lot of different things going through my head. 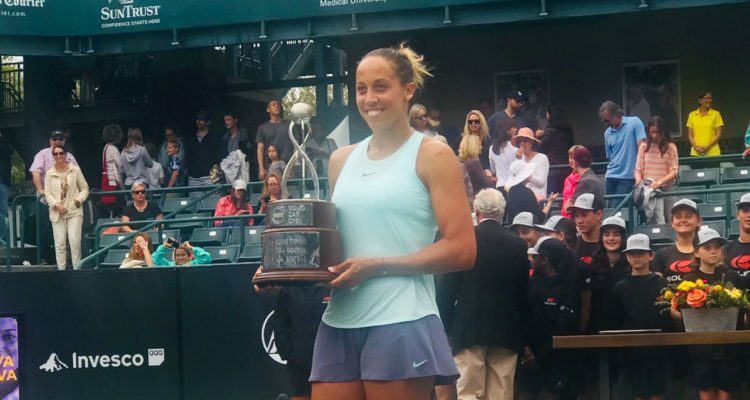 Now, with a new trophy and a new car to go along with a recently-purchased new house (with a three-car garage) in Lake Nona, Florida, near the USTA Training Center, Keys has a lot of new stuff – plus a new-found optimism that she displayed throughout the Charleston tournament. Although World No. 13 Caroline Wozniacki came up short in her final against 18th-ranked Madison Keys, losing in straight sets, she told the WTA website during an interview that Charleston was “a great start for me for the clay season because we go from hard court to a little bit of an easier clay transition. “With the green clay, it’s a little bit less slippery. It’s a little faster. So I enjoy this surface a lot. And then, yeah, from here to move on to the red clay, it’s much easier. No. 4 seeds Anna-Lena Groenefeld of Germany (ranked 31st) and Alicja Rosolska of Poland (ranked 46th) won the Volvo Car Open doubles title over Irina Khromacheva and Veronica Kudermetova, both from Russia, 7-6 (7), 6-2. The winners saved one set point in the first set and converted six of nine break points en route to their victory, which earned them $44,200 (U.S. dollars) and 470 WTA rankings points. This entry was posted in WTA Tour News and tagged Madison Keys, Volvo Car Open, WTA.